Be wary in signing deal with atheistic Communists, Confucius might have said, had he lived another millennia or so, only to see his nation descend into the bathos of Marxist ideology. I hope, against hope, that the Vatican knows what the Church is in for signing a concordat with China, not least in giving the Communist regime a large say in choosing future bishops. There is a complex history to how bishops are chosen in the Church. Saint Augustine was almost forced by the people of Hippo to become their bishop. As more temporal authority devolved upon bishops, the emperors and kings took matters into their own hands, claiming their own right to choose who would lead their dioceses and, all too often, their armies. The Church realized that she could not give up her right to choose her own bishops without ceasing to be a Church, and the impasse was resolved, somewhat, by the Concordat of Worms in 1122, with the Church investing the new bishop with a ring and crozier, symbolizing the sacramental and spiritual power belonged to her. Bishops have long since lost much of their secular clout, but many kings of the earth still held onto the rights of nomination of candidates, even vetoing the election of Popes in conclave. But the ultimate choice for bishop has always been left, at the end of the day, to the Pope. In the modern era, candidates for the episcopacy are chosen by a complex process, emanating from Rome and the Curia for Bishops who send out questionnaires, narrowing down a list from potential priests (at least, almost always priests, but they need not be ordained, just male and Catholic). Once this short-list is formed, it is forwarded to the Pope who, in consultation, decides on the candidate, who is free to accept the offer or not (but may have some coercion in conscience). But there are exceptions to this process. China, since Chairman Mao’s takeover after World War II the People’s Republic of China was officially established on October 1, 1949) and the nation now of over one billion souls, give or take a few million murdered along the way, has been under dictatorial, atheistic Marxist rule ever since. 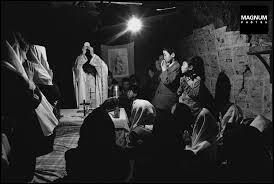 With religion officially under the control of the ‘State’, the Communist government, after expelling Catholic priests and missionaries, established the ‘Patriotic Catholic Church’ in 1957, and ever since there have been two ‘Churches’ in China: The above-ground, official pro-Communist, schismatic Church, with bishops illicitly ordained without papal approval (and subsequently excommunicated). And there is the faithful underground Catholic Church, with its own bishops and priests in Communion with Rome, many of them ordained in pectore (in secret) who have remained faithful through brutal persecution. The Vatican, in her long-standing desire to unify the two ‘Churches’, has, after all these decades of impasse, just signed a deal, the details of which remain secret, but, from what we know, seems to allow the Chinese Communists to choose candidates for bishop (a big sticking point); in turn, the Vatican has the right to ‘veto’ any given man. But this veto is not unlimited, and in fact seems to be limited to two or three times. The deal apparently gives near-total control in choosing bishops, all of whom will presumably be fully compliant with Communist principles – which Pius XI described as intrinsically evil, and that one could not at the same time be a Catholic and a socialist. Sure, it seems the Pope will be recognized as the ‘spiritual head of Catholics’, but what does this mean if he can never exercise any real power in choosing, nor governing, those who will govern the Church? Cardinal Zen, who has some experience of the nature of Communism, its lies, deceits and totalitarian nature, has described the recent rapprochement as ‘selling the sheep to the wolves’, sheep who have suffered for years under Communist rule, bishops, priests and laity, who have striven against great hardship to uphold the rights of the Church. Perhaps Douglas Farrow is right, that this potential conflation of the Church and State has ushered in the age of Anti-Christ, with plenary spiritual power given to ‘men of lawlessness’ to govern the Church, not least the ‘dear leader’ Xi Jinping, a model that may now well be adopted by other nations. Yes, sure enough, he smiles and looks like Winnie the Pooh (images of whom have been banned in China to prevent mocking caricatures, signifying the far reach of the Communist machine); but good old Xi is anything but a bumbling honey-loving, cuddly bear. Rather, he governs with a Marxist iron fist, from the strictly-enforced two-child policy to the tight lid kept on any religious activity. On that note, this accord has arrived at quite an inopportune time, with Jinping and his Communist thugs engaged in an active persecution, bulldozing churches, banning religious symbols, and arresting Christians, many of whom are sent to ‘re-education’ camps. As well, what are we now to make of the sufferings, perseverance and fidelity of the ‘underground’ Church, who have held out in fidelity to Rome all these years in the face of unbelievable suffering, now with a number of her courageous bishops asked to step aside, to make room for their above-ground, compliant, Communist-friendly replacements? One wonders how the Catholic Church in China will remain true to the Gospel and to revelation. Will the underground Church remain, and to what ‘Rome’ will she be faithful? The Holy Father has taken ‘full responsibility’ for this deal, claiming he still has the final say on who becomes a bishop, and we may hope and pray that this concordat produces the good fruit that is hoped. Further, the Vatican claims that the deal can be relinquished if things don’t go well. But Jinping and his Party may have something to say about that.